Facilities for the Physics Department in the Koshland Science Center include three well-equipped laboratories for instruction, all featuring computerized data acquisition systems. The facilities for intermediate and advanced lab courses include a thin metal film deposition system, a chemical vapor deposition system (mostly used for making carbon nanotubes), microfabrication facilities, a cosmic ray experiment, atomic spectroscopy experiments, an instructional scanning tunneling microscope, a laser tweezer experiment, and equipment for experiments in micro-fluidics, among many others. The laboratory for Nanofabrication and Scanning Tunneling Micros-copy houses an ultra-high vacuum scanning tunneling microscope (STM) with atomic resolution, an atomic force microscope, two high-resolution optical microscopes, photoelectronic characterization equipment (including Ar ion and HeCd lasers), a UV-vis spectrometer, and an ultrahigh vacuum chamber. The Biophysics laboratory includes a Microscopy and Manipulation Cluster for Biology and Nanoscale Science, shared with Biology and Chemistry. This facility provides a unique combination of capabilities, including a high resolution atomic force microscopy capable of imaging biological samples in solution, and a laser tweezer and micromanipulator/ microinjection system for manipulating biological samples. Additional facilities include a Langmuir trough for fabricating synthetic ion channel biomembranes, and a video fluorescence microscopy system for studies of model membrane systems. Computational science is currently undergoing rapid growth in physics and astronomy with the acquisition of a shared 200-processor, high performance computing cluster. Faculty from physics and astronomy, biology, chemistry, mathematics and computer science are working together to maximize the curricular benefits of these activities, including the enrichment of computational concentrations within existing departments, and opportunities for undergraduates to participate in computational research in all departments within the Koshland Science Center. We use a variety of technical software in our courses and research, including Mathematica, MatLab, Python and Origin. This software is available on computer clusters throughout the science center (including three computers in the student physics lounge), and also can be installed on student-owned computers in dorm rooms via a key-server system. Astronomy facilities include the William J. Strawbridge Observatory given in 1933 and built around an earlier structure. The observatory has its own library, classroom and computing workspace for departmental students. 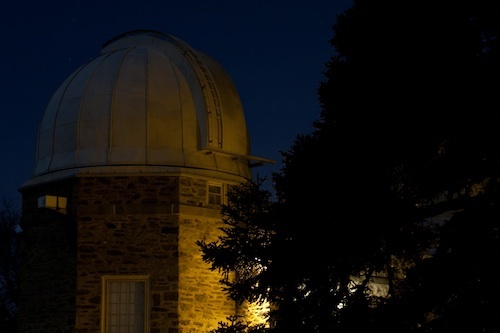 Haverford is part of the KNAC eight college consortium which provides research assistantships for a summer student exchange program, grants for student travel to outside observatories, and a yearly symposium at which students present their research. Visit the Strawbridge Observatory website for public observing dates and further information.